If you read the articles on this blog regularly, then you would know that I’m terrible at quite a few things. Maths is definitely up there with the things that I am most crap at. At school my teachers would tell me that I needed maths for all sorts of things in life and I never believed them, but as much as I hate to say it they were right. Except for algebra, no one should ever be subjected to algebra. To be honest, you can get by on some pretty simple maths in most situations, it is really just a matter of learning what you need to know, finding the short cuts and committing them to memory. If you find math boring like me, then even learning what you need may seem rather difficult, the secret is to find the right perspective. Percentages were never awesome at school, so why should they be awesome now? Because when you get older and have money to spend, they stop being about your grades and start being about bargins! It’s all about not paying retail these days, everyone loves a good sale. Although we all love a discount, the surprising thing is that most people don’t know how to calculate the saving on a marked item. 50% off, sure that’s half price and the signs usually tell you so. After that though, things get a little shaky. I’m going to try and simplify percentages for you as much as possible here, so that you do less guessing when you go shopping and spend a little smarter. Let’s go back to school really quickly to understand what the word PERCENT actually means. The first part (PER) – as in 24 bottles of beer PER carton – means FOR EACH. The second part of the word (CENT) – as in century – means 100. So what we are actually saying when we say percent is ‘for every 100‘. Hopefully you are following me so far, if not we can put it another way. There are 100 cents in a dollar (at least there are in Australian, maybe you have 100 pennies in a dollar, or 100 pence in a pound) so 100 cents equals 100 percent, or a dollar. Now if I said to you, ‘find me 50 percent (50%) of 100’, what I’m really asking is for 50 out of 100 – simple, it’s 50. If I asked you what 15 percent (15%) of 100 was, you would also know that it is 15. Easy right, but how does this help? Understanding that all we want to know is just how many parts of 100 we want makes all the difference, let’s try a few quick examples to showcase your new found skill. Lets say you call your insurance company to negotiate a discount and they offers you 15% on your standard house insurance premium of $500, you probably want to know how much that is before you accept the offer, but don’t have a calculator handy. You already know that 15 percent is 15 out of 100 (or $15), so you just need to add together five lots (for $500) to get your answer: $15+$15+$15+$15+$15 = $75. Your total insurance cost is now $425 ($500 minus $75). Sweet, we are solid on the insurance, but what about calculating a tip? In Australia, we don’t really tip, but it sure had me thinking pretty hard when I was travelling in the States. If you do need to leave a tip, let’s say 20%, you can work that out too. You have had a great meal and the bill arrives, total cost $40. Tot leave a 20% tip, you need to work out how many parts of 100 20 is, but the total cost is less than 100… luckily our user friendly currency systems can be broken down to smaller units. If we drop a zero from the 100 and one from the 20, we find our solution. I could tell you why, but you don’t care. Instead, just believe me when I tell you 2 in 10, is the same ratio as 20 in 100 (told you anyway – we are just using smaller numbers for the same principle). So for ever $10 we want to pay a $2 tip, there are 4 lots of 10 in $40, which means we tip 2+2+2+2=$8. Your meal, plus tip is $48 ($40 plus $8). Note: After a good meal and a few drinks all that calculating can get tricky. My preferred option is to round off to the nearest $5. Why $5? I’ll show you. Most of the time the cost of the things we want to buy don’t finish with neat little zeros at the end. Generally they cost $23.25, or $17.56, or $45.49. Sure you could work out the exact percentage for each, but the difference is generally so small in these cases it is easy to round up or down to the nearest $5. OK, so we want to work out a 15% discount for a book that costs $23.25 – too hard, lets round up to $25 instead. You might still be a little intimidated by that 5 sitting on the end instead of a zero, but we can sort that out. First, we can work out 10% of $25 using our previous example. 10% equals $1 in ever $10, there are 2.5 lots of $10 in $25, so 10% equals $2.50. to get the other 5%, just half the figure you got for 10%, $2.50 divided by 2 equals $1.25. 15% of $25 therefore equals $2.50 + $1.25 = $3.75. Our book will cost us no more than $21.25 ($25 minus $3.75). Percentages are easy because you know exactly what you are dealing with every time. Break down every number that’s asked into questions of 100, if the number is less then 100, then drop a zero and work in tens instead. The only way to get quick at doing this in your head is to practice. 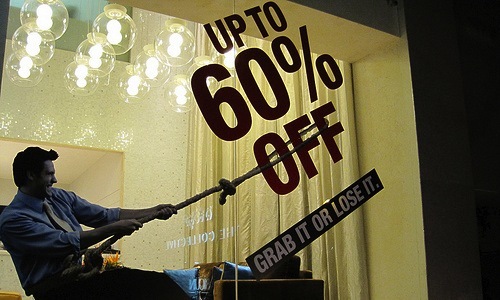 Next time you go past an item on sale, try calculating the discount yourself. Are you good with percentages?